Commercial-grade, professional cleaners for all pool types, sizes and shapes. Dolphin’s commercial line of robotic cleaners feature heavy-duty cleaning performance, with robust reliability for long-term, cost-effective operation. Dolphin is the proven, professional solution for any commercial pool – from small public pools to the largest commercial aquatics environments. 30 years of advanced robotic research and innovation stand behind every cleaner, ensuring comprehensive scanning of the entire pool and highly effective brushing and filtering throughout. And by automating your pool cleaning, your staff is free to focus on other tasks while Dolphin delivers a sparkling clean pool and clear, healthy water. A hard working robotic commercial-grade pool cleaner designed to delivery performance and reliability at an affordable price. 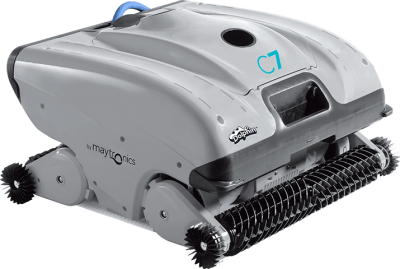 This Dolphin robotic pool cleaner actively scrubs all pool surfaces while filtering the water and its robotics scanning ability ensures the entire pool is clean. Dual-layer top loading filtration system separates and filters rough, fine and ultra-fine dirt for highly efficient, clog-free filtration. Snaps apart for super easy cleaning. CleverCleantm technology advanced navigation system and scanning software. This ensures that every inch of your pool – walls, floor and waterline – are cleaned using the most efficient route. So smart, the system automatically navigates around obstacles and quickly returns to its route. 360o Dynamic Dual Drive-motor for precise maneuverability and coverage regardless or shape, slope and obstacles. This easy to operate Dolphin C4 pool cleaner is recommended for small to mid-size commercial swimming pools. Dual-layer, top leading filtration system separates and filters rough, fine and ultra-fine dirt for highly efficient, clog-free filtration. Snaps apart for super easy cleaning. The Dolphin C5 is an easy to use robotic swimming pool cleaner recommended for a small to mid-size commercial pools. Its dual drive motors and split brush technology provide incredible maneuverability and coverage while its digital remote gives the user pinpoint navigation and control. Bottom loading filter bag with large surface area of specially constructed fabric, the filter bag is highly efficient at catching a large amount of debris, dirt and dust without becoming clogged. This enables efficient cleaning throughout the cycle. The Dolphin C6 Plus boasts double filtration for swimming pools and scrubbing power with adjustable pool parameters and choice of cycles. The Dolphin C7 makes maintaining your pool facility a breeze. Just plug in, press power and go! When finished, just open, remove and rinse filters clean. CleverCleanTM coverage is powered by an advanced navigation system and scanning software. This technology ensures that the most efficient route is used to clean your pool floor. So smart, the system automatically navigates around obstacles and quickly returns to its route. 360 degree Dynamic Dual Drive-motor for precise maneuverability and coverage regardless or shape, slope and obstacles. Top loading dual level filtration basket. The dual-layer filtration system separates and filters rough, fine and ultra-fine dirt for highly efficient, clog-free filtration. Snaps apart of super easy cleaning.